Largest Indoor Arcade in Tampa, Florida. The Perfect Place to Spend Time With Your Family! PK's Play Zone & Grille is one of the newest and largest indoor Family Fun Center's located at 10019 West Hillsborough Avenue, Tampa, Florida 33615. Our 43,000 square foot family fun center hosts several attractions and has over 110 arcade games making it the perfect destination for Parents and Kids. PK stand for a Place For Parents and Kids. Our facility also serves delicious food at our restaurant and provides great drink specials at our full service bar. PK's Play Zone & Grille aims to provide a clean, fun, and safe environment for our guests at an affordable cost. Come visit us in our fun and friendly atmosphere where your entire family will find something to do and enjoy. 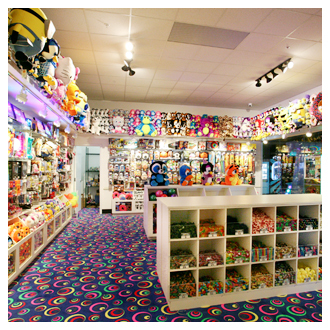 In total we offer over 110 arcade games, 6 EPIC attractions, and pool and dart boards. PK’s host 6 attractions- Laser Tag, Ropes Course, Rock Climbing Wall, Mini Golf, Indoor Bowling and Toddler Play Station. Soon we will open “Great Ninja Worrier” attraction. Monday we are closed except during school holidays. Attractions will open at 4:00 PM on weekdays while school is in session. Restaurant will open at 3:00 PM on weekdays while school is in session. All attractions will be closed one hour before close of business.